The ImWind Technik GmbH, as part of the ImWind Group which was founded in 1995, is an engineering company that successfully develops and operates renewable energy power plants in several different countries, with the main focus on operations of wind farms in Austria. Starting with 60 wind turbines with a total installed power of 152 Megawatts at the beginning, the ImWind Technik GmbH is now using BaxEnergy’s Energy Studio Pro® to monitor, analyze and optimize 95 generation units of different manufacturers in 14 assets with a total installed power of 242 Megawatts, including a photovoltaic power plant. With the increasing number of wind turbines and different manufacturers, ImWind faced several problems that demanded a powerful power plant management solution with customization options, in order to operate the assets more efficient and less time-consuming. As soon as you start to operate wind farms of more than one supplier, they become hard to manage says Richard Distl, Managing Director and Head of technical operations at ImWind Technik GmbH, who highlights that keeping the data quality high is the biggest challenge. That’s where Energy Studio Pro® came in. A significant factor for us was to get an open solution that allows us to access the data-base directly, if needed, because I do not like pigs in a poke. 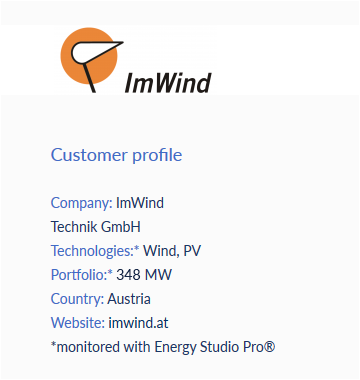 Energy Studio Pro® is set up in ImWind’s monitoring room in Vienna and assists them in various ways. With the help of workflows, they generate personalized reports automatically and the innovative alarm viewer with custom alerts notifies them as soon as their power plants are underperforming, even if the manufacturer SCADA tells them that they are performing well. On top, Energy Studio Pro® allows them to easily evaluate and compare production, availability & efficiency KPI. Since they introduced Energy Studio Pro®, ImWind has been much more responsive to power plant issues. Programmers, database experts and product developers – they are all on a high level. After five years, ImWind looks back on a successful partnership with BaxEnergy and towards a bright future.